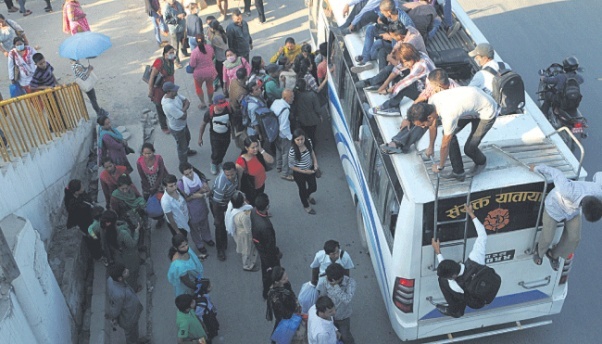 KATHMANDU, Aug 28: The government is moving ahead with an amendment in the law to provide that the route permit of vehicles carrying passenger more than its capacity or plying without receiving a permit will be suspended and annulled. Responding to a proposal of public importance on making the transport sector safe tabled at the parliament meeting on Sunday, Minister for Physical Planning and Works Ramesh Lekhak said the amendment will also include stringent measures as revoking the driver's license and the route permit of the vehicle if found plying without acquiring the route permit. He also shared about the government decision to expand the transport management offices in order to ease the pressure on service recipients, including an office each to check and monitor public transport vehicles in all the seven proposed provinces. Also at today's meeting, Minister for Energy Janardan Sharma tabled the 'SAARC framework agreement on Energy Cooperation (electricity)', after a statement on the same. Likewise, on behalf of Deputy Prime Minister and Home Minister Bimalendra Nidhi, Minister Lekhak tabled a proposal seeking the consent of the house to present the Bill relating to the control of torture, cruel, inhumane or degrading treatment, 2071 B.S.